The crowned lemur is described as completely covered in a wooly blanket, and its distinguishing feature is a bright orange crescent centered on the forehead and arching back to the ears -- hence, crowned lemur. There is a distinct difference in colors; females have an overall gray color with a dull orange-brown back, while males are orange overall with the back being of a more chocolate hue. Males also have a black center to their crown. Their face is typical of lemurs, round and ending in a short black snout. They have sharp claws on all fingers and toes. The body is about 14 inches long with a tail length of 18 inches and a weight of about 6 pounds. The range of the crowned lemur is extreme northern Madagascar. Crowned lemurs inhabit areas from moist to dry tropical forest, ranging from sea level up to 1400 meters. These mostly diurnal primates tend to be social, living in groups raning in size from 5 to 15 individuals, with an average group size of 5 or 6. Crowned lemur groups usually contain several adults of both sexes. It has been suggested that group size decreases in more humid environments. Foraging often takes place within subgroups of the larger group, and special vocalizations may be used to maintain contact between different subgroups. Interactions between larger groups are rare. Females in the group are dominant over males, giving them advantages in food selection and choice of mates. Grooming other group members is important in the development and maintenance of social bonds. This is true for all prosimians. 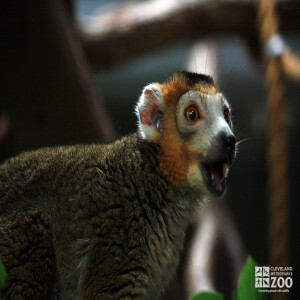 Crowned lemurs are active from sunrise to sunset, but they will often take a noon break that can last up to four hours. Groups travel after nightfall. Matings of crowned lemurs occur in late May and June, resulting in births between mid September and October. Earlier births coincide with the first rainfalls. Early births also tend to occur in nutritionally richer, wetter areas. Conversely, later births seem to occur in drier forests where fruit availability is low. Nursing continues until 5 to 6 months of age. Sexual maturity in crowned lemurs is reached at approximately 20 months.These lemurs are polygynous, but are usually housed as monogamous pairs in captivity.